A major rescue mission has been carried out by big-hearted paramedics to bring a little kitten to safety. 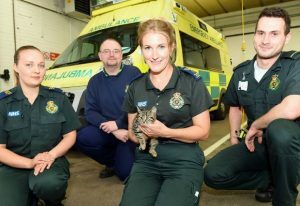 It has been a dramatic week for Ducato, a tabby, who was rescued on Wednesday after it scrambled inside an ambulance at Distington Ambulance Station. 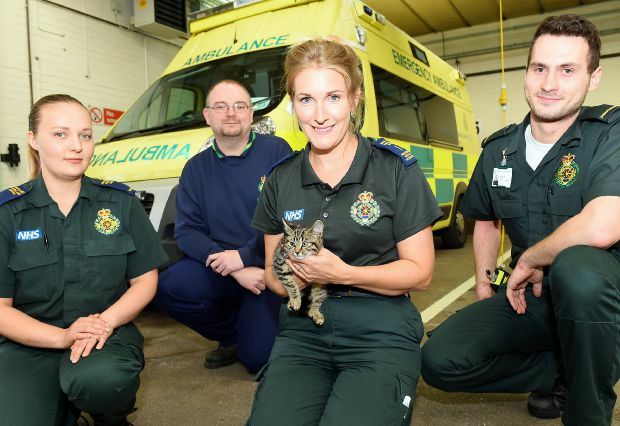 Several attempts had been made by paramedics from the North West Ambulance Service to rescue the scared kitten which had been spotted around the ambulance station numerous times, but it had fled in fear. Diana Beattie, who is a paramedic and also chairman of RSPCA West Cumbria, has spoken about the team’s heroic rescue efforts. Rescuers have affectionately named the kitten Ducato, after the model of the ambulance it was rescued from. It is now being cared for Chris Gurney, who works in the workshop for North West Ambulance Service at Distington. Diana says a mammoth rescue mission involving numerous paramedics was carried out. She said it is sheer coincidence that she along with others ambulance workers are also involved in RSPCA West Cumbria. Paramedics Mia Cavaghan, Ed Ashburner and Sophie Dowler spotted the scared kitten at the ambulance station on Tuesday night. She said Ed wrapped the kitten in a blanket and brought it inside. “It was so terrified. It bit Ed on the finger,” said Diana. Subsequently, the paramedic had to go up to hospital to get a tetanus injection. Paramedics attempted to coax the animal to safety using tuna and prawns, but it was “absolutely terrified” and “bolted out of the door”, said Diana. Diana said, in her role with the RSPCA, she sent two of the organisation’s foster carers to find the cat and bring it to safety. They were unable to do so, but, the saga did not end. Paramedic Kath Martin spotted the kitten the next day, and raised concerns. The kitten was later discovered in the engine of an ambulance which was off the road and had been taken to the station’s nearby workshop. Diana said David Braniff heard a noise and discovered “a tiny ball of stripes”. It took an hour to rescue the cat who had fallen further into the engine. Animal-lover Diana said Ducato is now receiving “much TLC and a warm cosy bed” with her carers. If anyone is interested rehoming the kitten, contact Diana Beattie on 01946 693585.